It is officially summer and it is HOT! 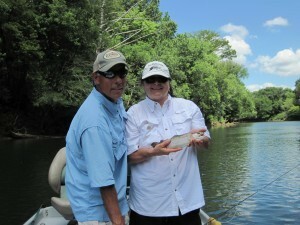 George and Diana made the trip from New Mexico to fish the Little Red River and were not disappointed. Both have done a good deal of fly fishing and as good fly casters they were able to make good presentations to spooky fish in low, clear water. We were fortunate that we had some cloud cover most of the day which helped the fishing and certainly made it more comfortable for our anglers. We released a bunch of rainbows, had a nice lunch on the river and saw several Bald Eagles and a Coopers Hawk. 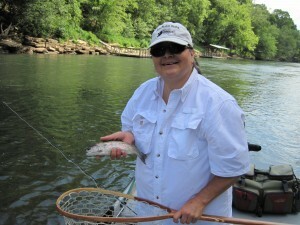 All-in-all another great day on the Little Red River.